The building collapse occurred immediatley next to the world-famous Mütter Museum at 19 South 22nd Street. 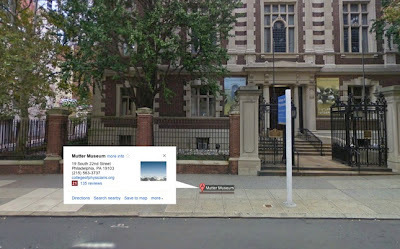 The Mütter Museum in Rittenhouse (ritten, Germanic origin, ride + hausen, house) Square neighborhood offers a vast collection of medical and anatomical oddities. The medical museum located in the Center City area of Philadelphia contains a collection of medical oddities, anatomical and pathological specimens, wax models, and antique medical equipment. 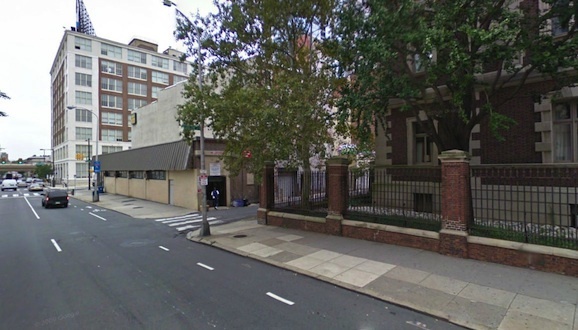 Above, on the right, is the Mütter Museum. To the left, in white, is the building that collapsed. America's finest museum of medical history, the Mütter displays its beautifully preserved collections of anatomical specimens, models, and medical instruments in a 19th century "cabinet museum" setting. The goal of the Museum is to help the public understand the mysteries and beauty of the human body while appreciating the history of diagnosis and treatment of disease. The Collection began as a donation from Dr. Thomas Dent Mütter, who was determined to improve and reform medical education. The donation stipulated that the College had to hire a Curator, maintain and expand the collection, fund annual lectures and erect a brick building to house the collection. Since 1858, the College has held true to its promise to Dr. Mütter. Today the museum enjoys steadily rising international popularity. Mutter Museum website. The building and area, before the collapse. The Mütter is immediately down 22nd Street. Emergency crews are at the scene of a building collapse in Philadelphia, and the fire commissioner says as many as eight to 10 people are believed to be trapped in the rubble. The accident happened at 10:45 a.m. Wednesday, June 5, 2013. A building on the block had been under construction. 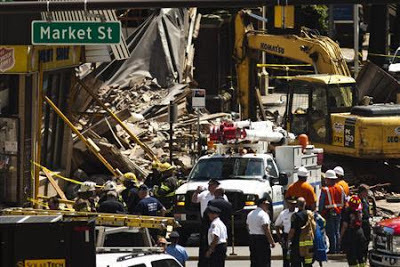 The collapse happened at a building at 22nd and Market Street in Center City. The building was reportedly being demolished at the time of the collapse. Debris came through the roof of a Salvation Army thrift store on the corner. Thirteen people were rescued from the building by firefighters. One man and five women are dead after a building collapsed in downtown Philadelphia. 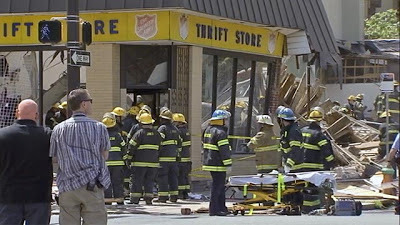 The collapse at 2140 Market Street happened around 10:40 a.m. when a four-story building came down on top of a two-story building, which housed a Salvation Army Thrift Store. 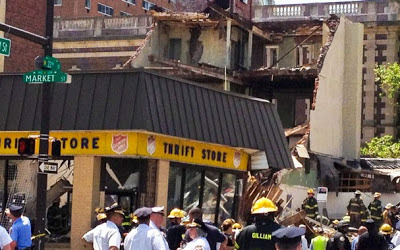 Early reports from Philadelphia Police indicate that the collapse may have been the result of an industrial accident, as construction crews were working on the nearby structure. Mayor Nutter said the woman who died was 35 years old and that her family didn't want any more information about her to be discussed publicly. Sources close to the investigation say the woman was a cashier at the thrift store and that Wednesday was her first day on the job. Source. 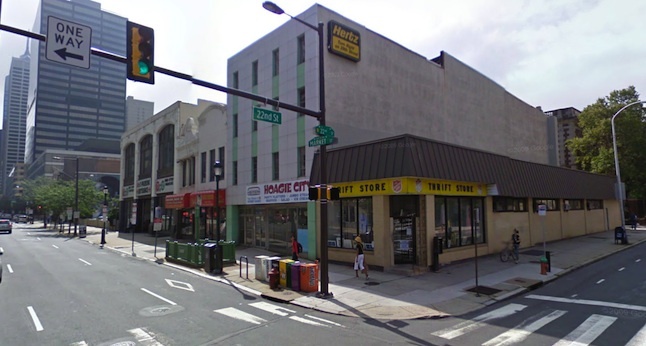 According to the demolition permit from Philadelphia's Licenses and Inspections, that building was a four-story structure. The demolition contractor is Griffin-Campbell Construction. H/T to anon for Mütter link. Nutter and Mutter. Huh. What are thr odds.